On Jan 26th, 2018, Enoteca will host its Annual Horizontal Wine Tasting event at the academy. With 5 Houses exhibiting their fresh vintage, this 4-hour long event is expected to be participated by roughly 40 pax of a mixed audience. This is not a competition or challenge so no wine rankings/ratings will be published by the organizers. Attendees are free to write their review on social media or blog in their individual capacities. 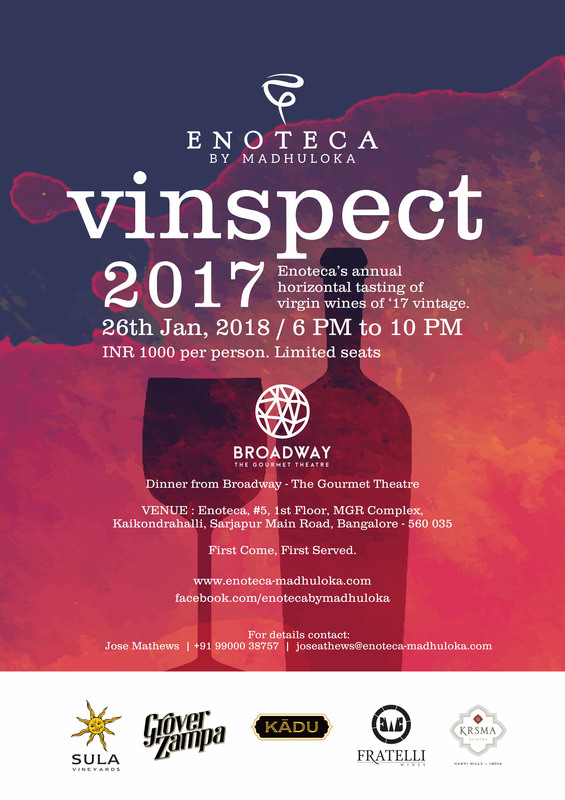 Participation in the event will be by invitation only from Enoteca by Madhuloka. Participation cost includes wines to taste, appetizers and Dinner. Paid seating is limited to only 20 pax. Please do come for our hearty wine tasting event and socialize with the Bangalore's wine folk.